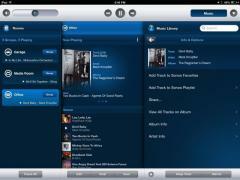 If you own the Sonos system, Sonos Controller is a must have tool, created specifically for the system. It lets you control and manage playlists for each room, with the possibility to change the volume and switch between audio files in a simple manner. Sonos is an advanced HiFi wireless speakers and audio components sytem, that let you play different audio files in each room, using a dedicated wireless network. The application makes it possible to connect the system to your PC and from there, manage all your music and playlists. To use Sonos controller, you’ll need a Sonos player plugged into power and connected to your router via an Ethernet cable. As a result, you’ll be able to use various music sources, along with multi-room functionality that lets you listen to whatever audio files you want in each room of your house. Different songs or the same tune can be streamed in each room using your smartphone, tablet or computer. Users can also choose a music source and see the currently playing song. Related details like album, artist and track number are offered as well.